The Canterbury Street lot is located in Cape Town’s East City district, just on the edge of the former District Six. The lot is directly across from Service Dining Rooms (SDR) and it also shares its space with a nearby business, Fruit & Veg. Many people live and work on the lot as unofficial parkers by asking for donations from those who park on it. The lot also contains a garden, which is part of one of Khulisa’s programs called Streetscape. The garden area is leased by Fruit & Veg to Khulisa, and those who participate in the program earn R50 per day. In order to advance our project on the Canterbury Street lot, we have to both think about and take into consideration the opinions of those who are currently in the area including, but not limited to, those who live, park and pass by it. On Monday, our team met one of the SDR team’s co-developers, Chris. Besides working as a co-developer and contributing with his own ideas, Chris also works as a mediator and translator. On that day, he took us to the Canterbury Street lot, where we met three parking lot workers – Michael, John and Izabela – and talked to David again. As our conversation developed, we briefly explained our project to them and asked for their input. David was the first one to share his thoughts. He told us that he would like to put a fence around the entire parking lot area in addition to two gates for the cars. By dividing the space, he wishes to limit those who work in the area and possibly set a fee for parking. Differently from David, Michael and John did not share any specific thoughts about the project during our conversation. However, Michael expressed a strong opposition to the gardening program by labeling it as “slave work.” Even though his words were harsh, Chris explained to us that the program causes changes in the area and that many do not agree with change. Consequently, Michael also seemed to be opposed to Khulisa, as it is the program’s sponsor organization and the one promoting the change. Even though both David and Michael had strong opinions about Khulisa’s initiatives, they were willing to have a meeting with our team and Jesse to better understand the project and how our collaborative work can benefit them. As we tried to engage more with them, it was possible to see that they were unhappy with our presence, especially Michael. Although our intent was to understand their point of view, it was clear that they saw us as outsiders and strangers. At one point, all of them started to speak in Afrikaans with Chris. Even though we felt very lost for not being able to understand their language, we could sense some tension and see that they were talking about us and wished for us to leave their space, which we did shortly thereafter. 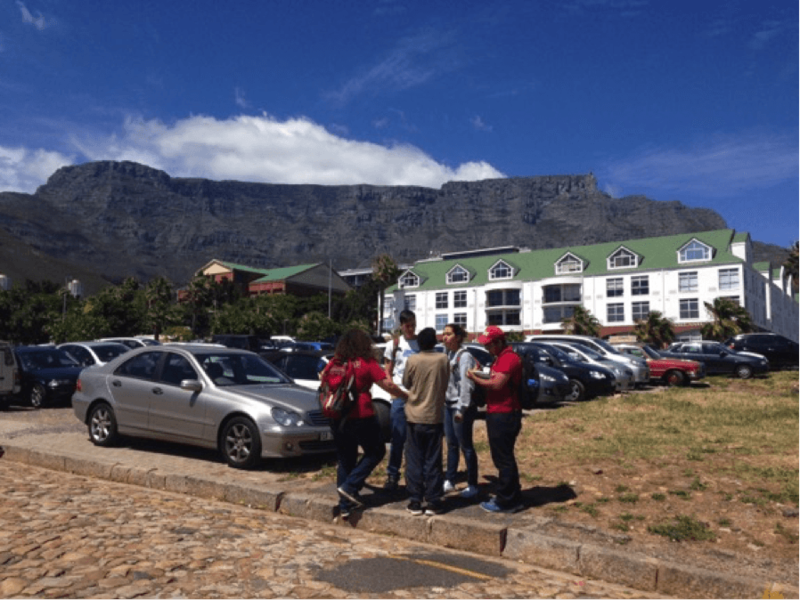 While we were walking back to SDR, we asked Chris about the conversation in Afrikaans and he quickly and vaguely responded that the parking lot workers were unhappy. He also shared with us that Izabela has a house somewhere else, but that she and her family live on the streets because of the gangs and poor safety condition around the area of her house. Chris remembered that there was a nearby parking lot and offered to take us there. Although only a block away, the difference between that parking lot and the Canterbury Street lot was enormous. The nearby parking lot looked more “official,” with a small establishment where the workers stayed and charged R20 per car. In contrast, Chris told us that the Canterbury Street lot workers earn anything between cents to a couple of rands per car. Since they do not have an “official business,” some people pay them monthly or give them a small contribution once they get back to their cars. However, others do not give them anything but claim that the workers were responsible for their cars when something bad happens to it. One of the biggest challenges that our team will face during these 2 months will be how to engage and work with the parking lot workers. We will have to try to gain a little bit more of their trust day after day, and show them that we want to hear and take into consideration their ideas and opinions about the project. We look forward to working with our co-developers to build this trust relationship and learn from them about the area and its history.